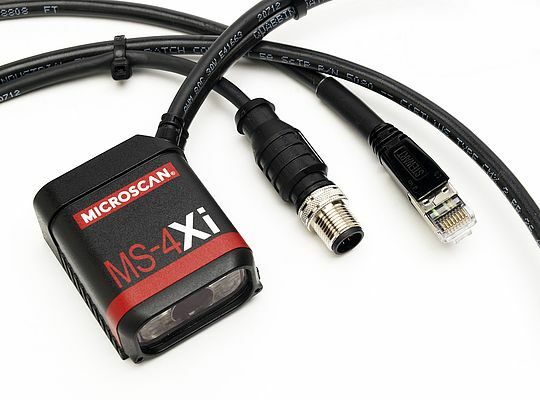 Microscan introduces the new Xi series of miniature barcode readers with embedded Ethernet. The MINI HAWK Xi and MS-4Xi imagers are barcode reading solutions for almost any automation environment, with decode algorithms to read nearly any1D/2D symbol, including the most challenging direct part marks (DPM). Both products feature 10 to 30 VDC power requirements, optoisolated I/O, and RJ45 and M12 connectors, along with compatibility with the supplier's full line of industrial M12 accessories. The imagers feature decode algorithms for reading damaged, distorted or difficult low-contrast codes, including direct part marks such as dot peen and laser/chemical etch. The MINI HAWK Xi additionally includes autofocus, and both high-speed and high-resolution configurations. The right angle mirror option and corner-exit cable are designed specifically to conserve cubic space for the tightest fit possible within instrumentation and equip­ment, or for mounting into robotic applications. The Xi imagers also include visible LED indicators, targeting laser pattern, "good read" green flash, and an EZ button for instant setup and configuration.